Mailed 11/29/18 to Subscribers. Allow 6-8 weeks for USPS delivery. Axis of Evil is an operational-strategic level two-player wargame covering a struggle between the Russian-led Eurasian Union and a Coalition of opposing states to gain control of the Middle East, from Iran to Syria and the Persian Gulf. 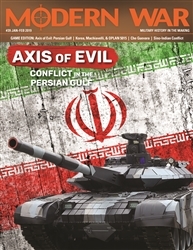 Possible combatants include Russia, various Middle Eastern states, China, Iran, and the Persian Gulf countries. The game system models the situation at the highest strategic level. Using a variation of Ty Bomba's Putin's War (MW #29). 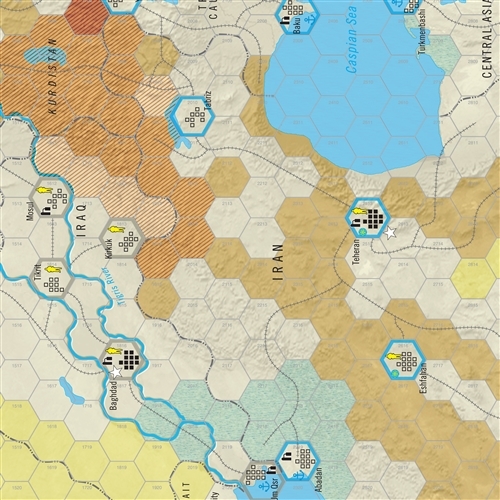 Each hex on the map represents 62 miles (100 km) and each turn of play represents anything from three days of intense combat to a couple weeks of refitting. Ground units represent mostly corps sized formations, with some divisional task forces. Special forces units are regiments, brigades or groupings of cadres. 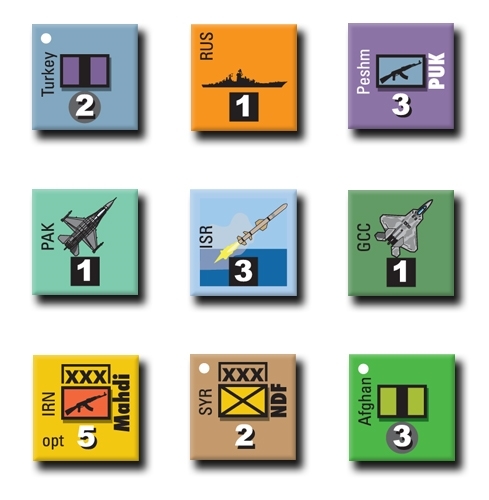 The combat aircraft units represent various numbers of sorties needed to accomplish missions over the time frame of a turn. The game system models operations in a vast theater with limited infrastructure and coalition forces which have divergent political aims with the objective of each player being to seize critical resource, logistics and communications centers, thereby gaining control of the Middle East.